As Christmas draws near, there are a few notices and important dates to remember. And of course a very Merry Christmas to all! Christmas Carols at the White Horse with Rev Simon Woodley, Tuesday 19th at 7.30pm. The draw for the White Horse Christmas Raffle, Thursday 21st at 8pm. Tickets on sale now from the pub, £1 each! Village Christmas Concert with Carols, Saturday 23rd in the village hall. Doors open at 4pm for minced pies and mulled wine (or apple juice) with the concert starting at 4.30pm to around 5.30pm. Christmas Day drinks at the White Horse from midday to 2pm. There will be no refuse collection on Monday 25th, instead black bins need to go out on Wednesday 27th. There will be no recycling collection on Monday 1st either, instead blue bins and black recycling boxes need to go out Wednesday 3rd January. The final change will be no refuse collection on Tuesday 9th, instead black bins need to go out on Wednesday 10th instead. There will be no garden waste collections over the Christmas period. Everything returns to normal from Monday 15th January. 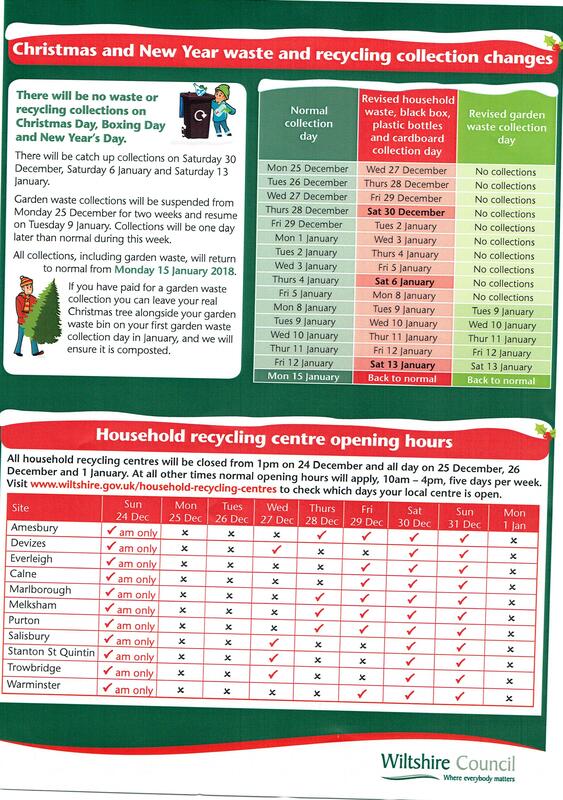 There are also closures at the various recycling centres across the county; please see the flyer for details (click the image for a larger version).